What is Quran Journaling? How do you set up your Quran Journal? Simply put, it’s the process of documenting your thoughts and reflections on the Quran in a (sometimes) creative way that helps you explore the meanings and make connections. When you take the time to reflect and ponder over the words of Allah, it changes your understanding of the Quran and takes your relationship with it from being a ritual into becoming a living breathing entity of its own. You get to know the Quran better, and relate to it in a more personal way. When do you find the time to reflect on the Quran? The best times are early in the morning or late at night. When your world quiets down and there’s no one demanding your attention or presence. Mornings are great because your mind is clear and you haven’t been bombarded by the rush of work, family commitments, chores, errands etc. Plus when you start your day with the Quran, even just reciting a few lines, there’s a tangible Barakah and ease that washes over your entire day. If your mornings aren’t an option maybe before you go to bed for the night and have some quiet time to yourself. How did you actually start your Quran Journal? Initially I started with a plain notebook, and was just writing down the surah and ayah number and my reflections on that ayah. Basically capturing the thoughts before they flew away. The first Ramadan I started journaling, I was reciting a section of the Quran in Taraweeh (night prayer in Ramadan) and reading the abbreviated commentary on the same section during the day, and jotting down my reflections in the notebook. I didn’t necessarily have a reflection for every single ayah, but I wrote down what came to me in my brief study and kept going. My aim at that time, was to get through the meaning of the entire Quran in the 30 days; which I didn’t manage to do, but made significant progress Alhamdulillah. 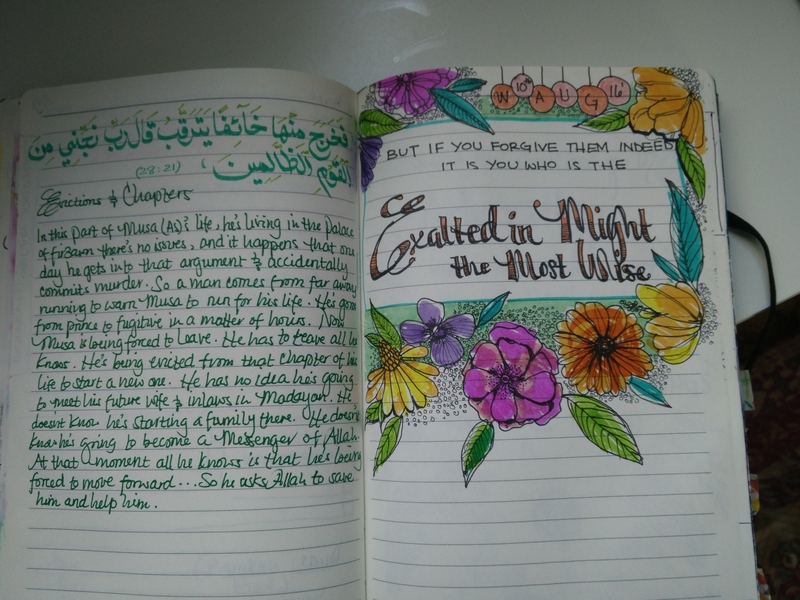 How do you get creative with your Quran Journaling? The next time I restarted my journaling with a creative twist. I was doodling, drawing and spending a good amount of time just being creative, having fun and allowing myself to enjoy the process. Being the productivity stickler and recovering perfectionist I am, I actually struggled to do this. I couldn’t help but feel I was losing valuable time ‘messing around’ in my journal, and absolutely hating my work if I felt it wasn’t up to scratch. It quickly became clear to me that being uptight and judgmental about my journaling wasn’t helping one bit. So I started sharing my journaling on a daily basis, do or die, mistakes, spelling errors, scratched out and struck out. Alhamdulillah, I’m proud to say I’m mostly over the making it perfect part, but still touchy about the quality of my work generally speaking. In my latest journal I’ve kept it simple — partially due to constraints on my time and my hoping to simplify the task to maintain consistency inshallah. All I do is write the date, ayah in Arabic, reference and reflection below that. The actual Journal I ordered as a custom notebook from Erin Condren; they allow you to change up the cover and give a few options on the page layouts. I’ve moved my creative journaling to a different notebook and only get to go all out occasionally. Alhamdulillah it’s great when it happens. What exactly are you doing when your reflect on the Quran? This is the same as asking: How do you come up with your reflections? What steps do you take to reflect on the Quran? Read the ayah or passage in Arabic, then read the translation: To get a basic meaning of what’s being said in the ayah or section. Come up with action points or practical steps to apply this knowledge or connect it to your reality. **If you’re looking for more, you can listen or watch a discussion of the ayat from a reliable source. Bayyinah TV is great as well as many teachers and shuyukh on Youtube. They’ve prepared from the books of Tafseer and are breaking it down for others to understand. How do you choose the ayat? Joking aside, in my daily reading (whatever that is) I pick an ayah or section that I felt I could relate to, and after exploring the meaning in Tafseer I write out my reflections on that. What resources/supplies do you use in your Quran Journaling? In Arabic there are tons of options with regards to books of Tafseer and explanations/commentary and discussions on Youtube or elsewhere. In English there are also a variety of Tafseer books out there. I highly recommend the Tafseer of Shaykh Abdurrahman As-Sa’adi (RA) because it’s brief, comprehensive and uses simple and clear language. You can find it on Amazon or ask around in your local Islamic Bookstore. English translations such as the Noble Quran and Sahih International are also widely available. There are many others, but the key thing is to find a book with language that’s simple to understand and follow so you aren’t exhausted by having to read it. For creative supplies, I use anything I can get my hands on. Gel pens, ink pens, calligraphy markers, felt tip markers, pencil colors, paint, glitter glue, paper, stickers etc. PaperMate InkJoy pens, Staedtler Calligraph Duo markers, Crayola washable Markers, Crayola supertips markers, Bic highlighters, Staedtler ink lining pens, Prismacolor ink and brush pens. Sounds Good! How can I get involved? You can join Iman Illustrated on Facebook, it’s a group for sisters (yes, ladies only) who are journaling through the Quran in a creative way. Brothers and sisters can also check Iman Illustrated out on Instagram or search for the imanillustrated hashtag. I pray that was helpful and it answered some of your questions inshallah. Jazakum Allahu khairan for reading. Alhamdulilahi !!!! Tnx for sharing your thoughts and breaking it down to minimal level for beginners like us to fully understand how to be more closer with the reading and having proper understanding of d teaching of d noble QURAN…..through recite n reflect journalism..
Ma Shaa Allah, may Allah grant you success in all that you do. This is truly beneficial. Ya Sumayah! BaarakAllah feeki…keep at it in shaa Allah! Alhamdulillaah this has inspired me to delve deeper into my own tadabbur of the Qur’an which I have recently wanted to do…but just didn’t know how to start! SubhaanAllah this is a beautiful way for me to get going and begin and bi’ithnillaah may this be the start of something amazing…small baby steps…Bismilllaah…. Barakallahu feek my dear…. MUCH APPRECIATED… May Allah put all your efforts weigh heavy on your scales Ameen. [Begin with Barakah] – What exactly are Affirmations? How do they work?